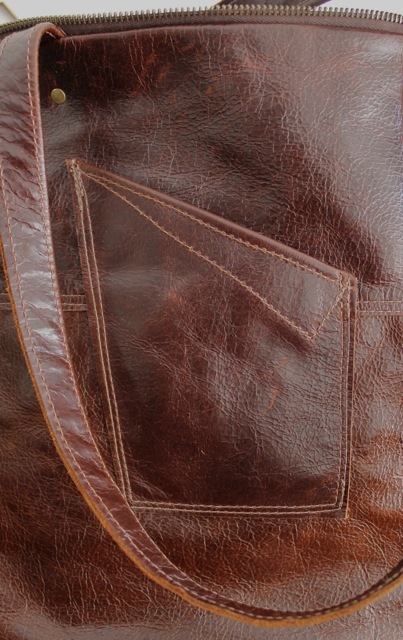 Here are a few glimpses of the last bag of 2013, the Rugged Grosvenor. It is made of a remnant piece of upholstery leather with lots of character. 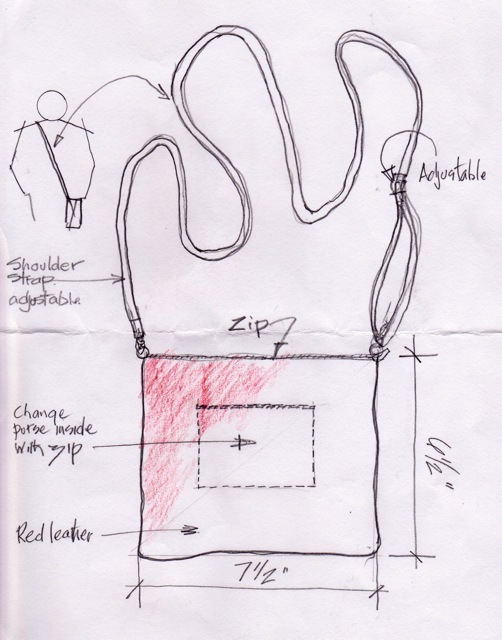 I find I enjoy working with limited material–it makes me look at the design in a new way. 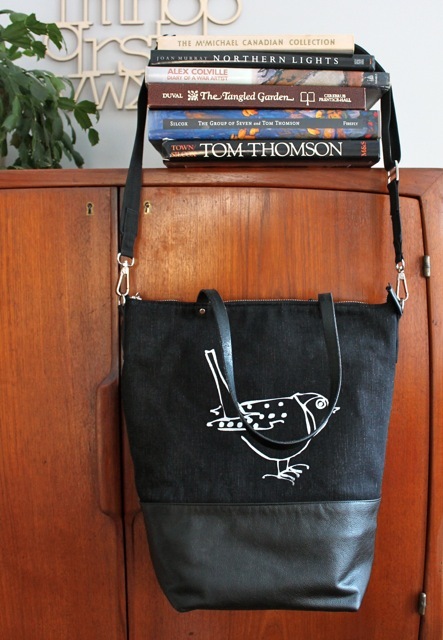 I have made two other Grosvenor totes, but this one is my new favourite. The fittings are brass. The pockets are many. A great travel bag for sure. Today was sunny so I thought it was a good day to sketch. I haven’t been sketching regularly for a while, but will soon be travelling again and I want to try to capture it all in my sketch book. Clearly, I need some practice! I had hoped I could sketch this building from the car, so I parked across the river, but there were too many icy trees between the building and me. So I stood with sketchbook in hand just across the road and did these two cartoon-like sketches in ink, pretty fast, straight on and from the side. This is one of my favourite local structures, the Henderson building, built in the 1850’s. Fortunately, the talks of its demolition seem to be averted for now. I didn’t plan this sketch very well –I was freezing!–I had no room for the main floor and the windows are a bit squished. But this building has so many interesting features, I am going to try again next week, taking a little more time. 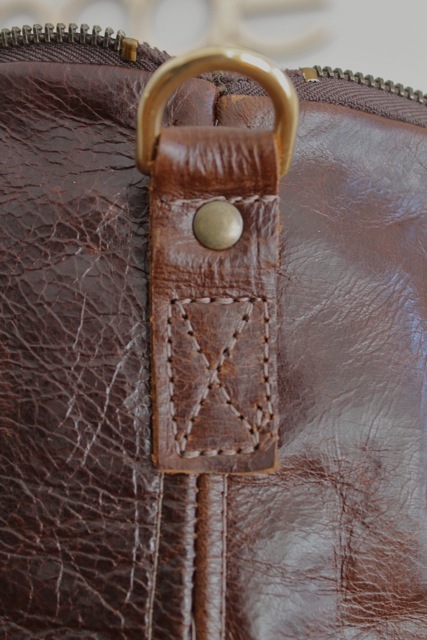 This is another modification of the basic Keller bag. 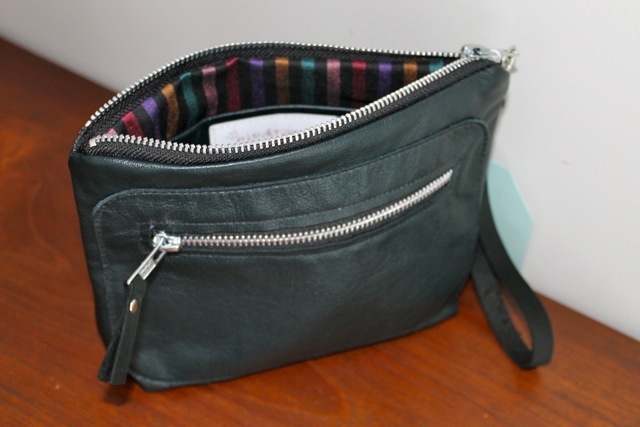 This one is not as tall and has an extra exterior pocket behind the zippered pocket. I think this will prove to be a useful and comfortable day bag. 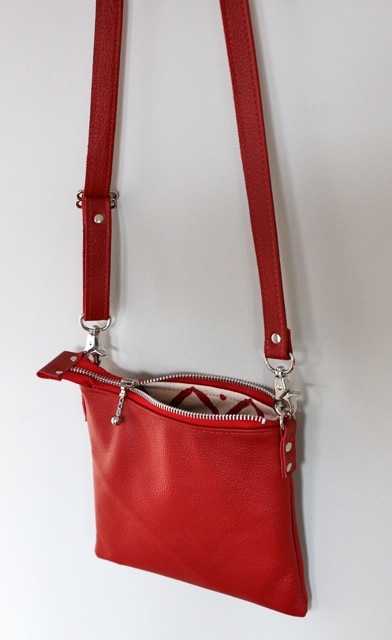 The pocket extends to a double bottom, making the bag very sturdy. Inside are two of my favourites: the great checked lining and the wwwdot birdbrain graphics on a double pocket. 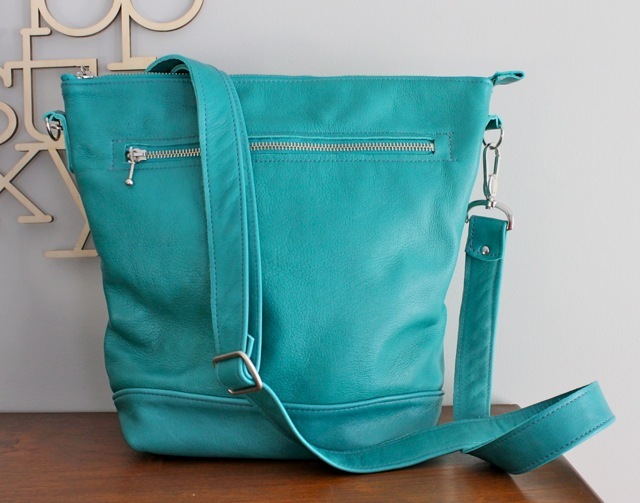 This bag is made to specifications for someone very special. It is the third bag of this leather, one of the most beautiful and largest hides I have ever used. I like to use recycled pieces but every once in a while something comes along that I know I want to work with. And there is enough left for two or three more. Meanwhile this one is wrapped and under the tree. 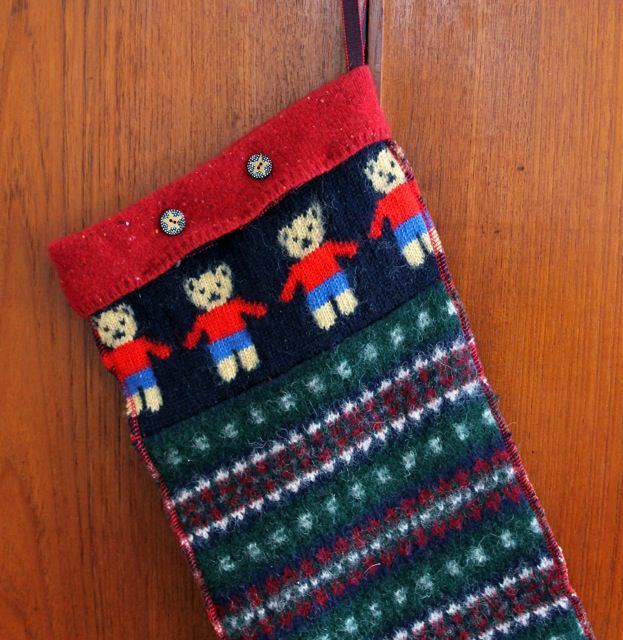 Making Christmas stockings from recycled sweaters is great fun. The trick of course is having the right sweaters. I knew when I found this Jenny Ferguson pure wool sweater from Scotland that it was perfect. The whole quest involved in reusing adds to the adventure. When you are least expecting it, the absolutely perfect sweater speaks to you from a rack of ugly acrylics. 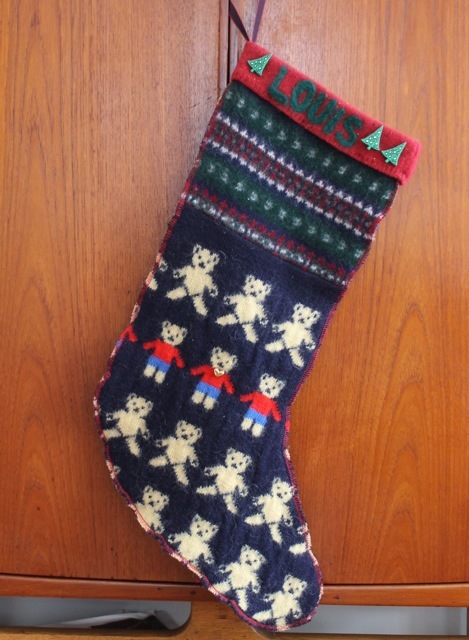 With these teddies taking centre stage, a little needle felting on the top and a few seasonal buttons were all that was needed to make the stocking ready for Christmas morning. Two new Friday pouches in two sizes are in the on-line store. The top one is a great leather, a kind of black/green, which was a skirt in a former life and the bottom one is a larger size in the traditional black with pebbly pocket. These pouches are made of recycled leather, have an exterior zippered pocket and an interior slip pocket as well as a removable wrist strap. 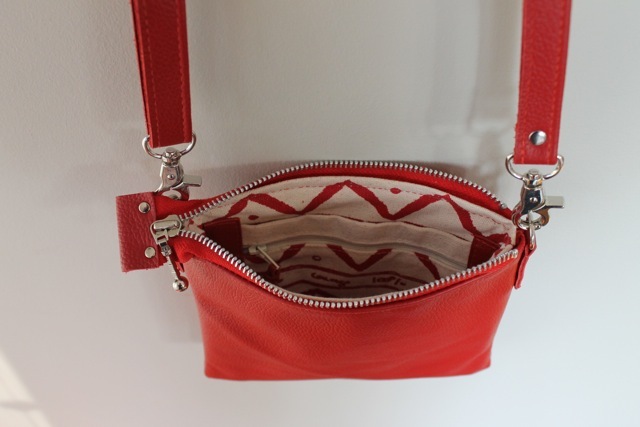 Great on their own to hold your essentials on a Friday night or on another day, thrown in a larger bag. 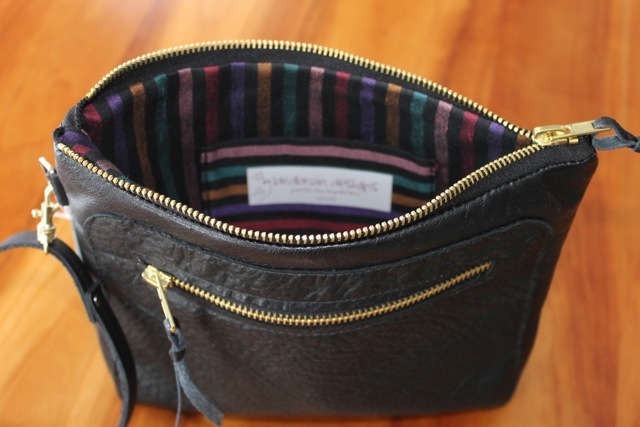 Lined with the Montreal striped fabric. 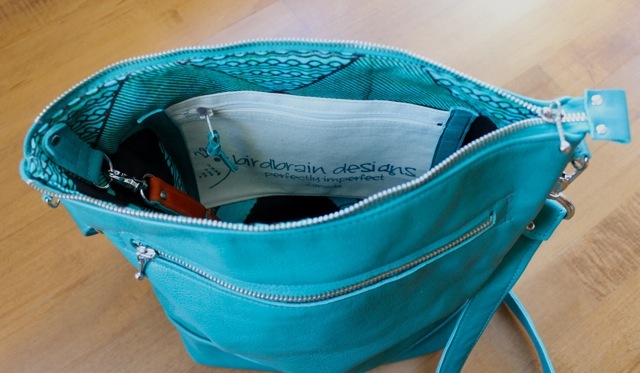 Here is a great versatile tote. 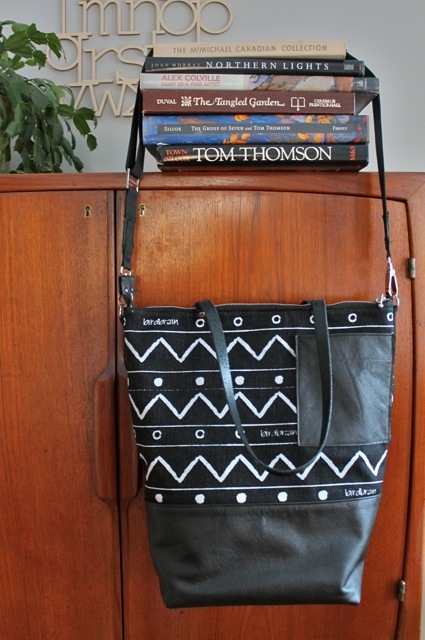 The outside is white screen printing on black denim with recycled leather bottom, sides and pocket. 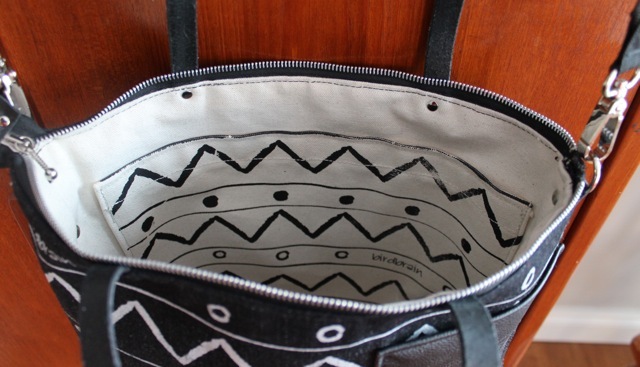 It is lined with canoe canvas, a very sturdy weight, so this tote is set to carry all you could want. 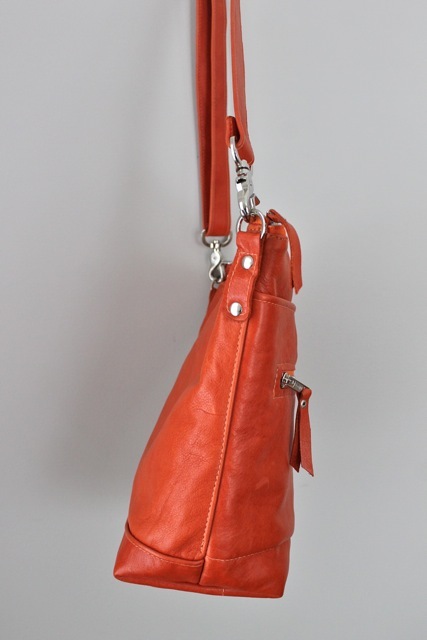 The leather handles are sewn in twice and then riveted for extra strength. There are two ample pockets inside, one screen printed canvas, wide and deep enough for your ipad, the other a slip pocket recycled from a leather jacket. 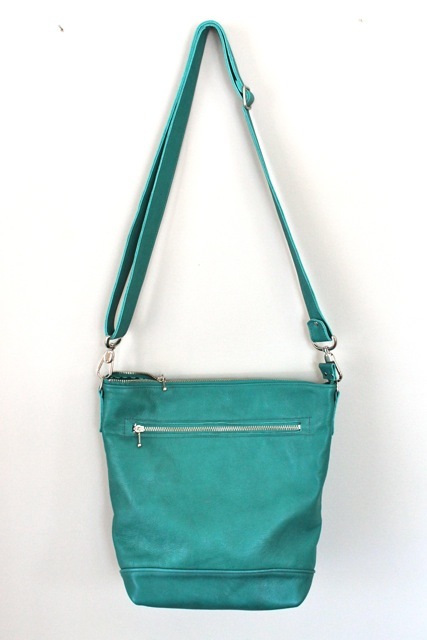 This tote is taller and narrower than the others of its kind and the perfect candidate for a shoulder strap. A super comfortable strap of wide webbing snaps on to tabs on the side, but can easily be removed. As I said in an earlier post, I have test-driven a tote of this group and found it well up to the task of carrying my travel and shopping needs. 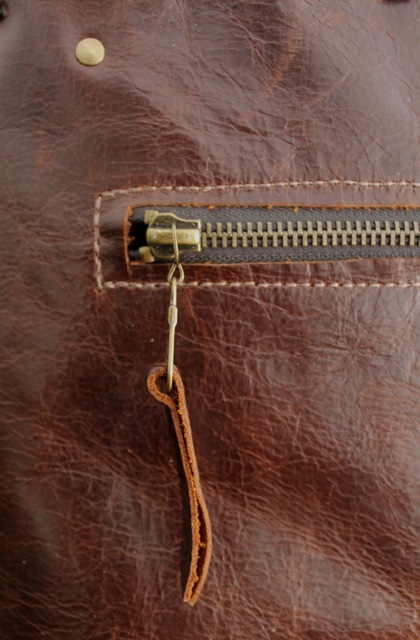 The metal zipper closing keeps all your belongings safe. I feel like I have been sewing for months, but do see the pile finally dwindling. I love making things. I am not complaining in the least. But it is time for a break. This is one of the last orders– a new turquoise Keller. It is finished and on its way to a someone very patient and understanding. I hope she finds that it is a good fit for her lifestyle and that the colour and design give her pleasure. This is roughly the same bag with a couple of additions. 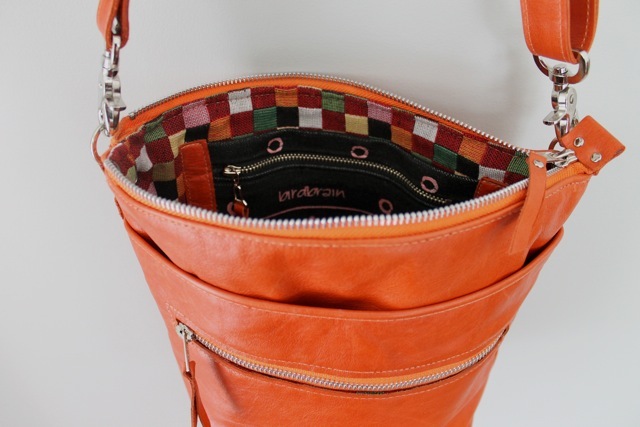 Inside, you will see a leather tab with ring for keys as well as a zippered pocket. The flash of orange inside attached to the ring is an additional key chain. The strap is a little wider and a little longer. 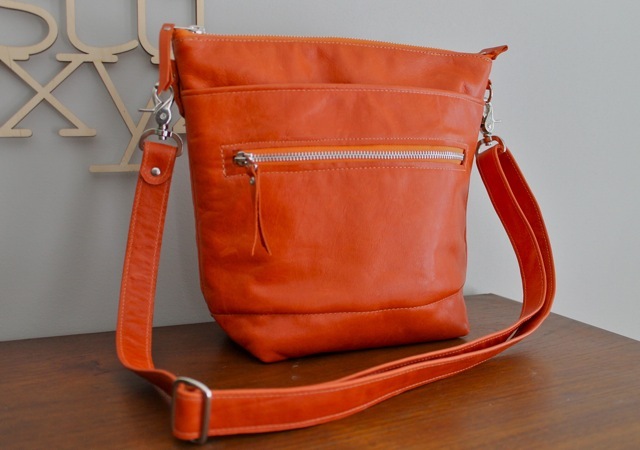 But overall it is the same Keller Bag, a great bag with ample room inside and a generous outer zippered pocket. It has a double bottom with metal studs to help it wear well. Here are a few more shots of it including that great lining from Kenya. The rug hookers in Ontario are a generous lot. 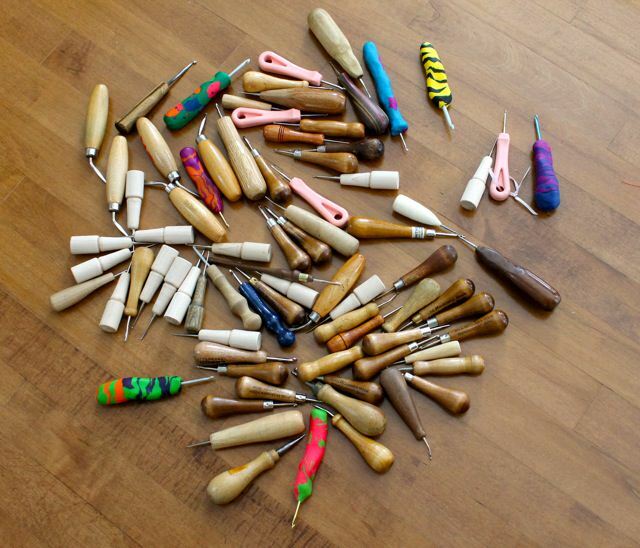 Below you can see some of the hooks that have been donated for the rug hooking project in Matangwe, Kenya. Thank you to everyone. To Claude who, in spite of illness, met me in town to donate her hooks. To Anne B. who collected hooks in her area and lugged them to the One of a Kind show for me. To Dianne who mentioned the project in the Ontario Hooking Craft Guild newsletter. And to the many other hookers near and far who heard of the hooking project in Matangwe and gave up their spare hooks. I have almost 100 now. And lots of burlap too. This is year two of the project. If all goes as planned this year, the women and men in the Matangwe community will draw patterns of the stunning local birds on the burlap and make hooked mats which we will eventually sell. I will be taking some t-shirts and dyed nylons which we will cut into strips, but my hope this year is that we begin to use local used clothing with the plan to eventually be self-sustaining. We will also begin to make our own hooks and hopefully find a source of local burlap–so that the project can continue after I leave. Thank you again for the great boost! My pile of orders is dwindling finally. 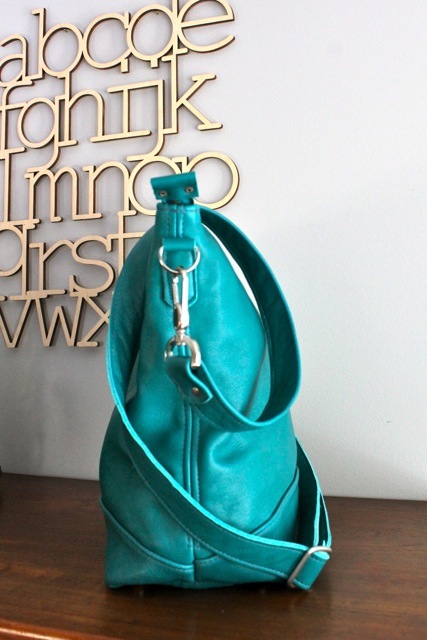 Today I am making another turquoise Keller bag for a special order. This is the second bag out of this beautiful leather and I think I may have enough left for a smaller shoulder bag. The lining is a piece of wax cotton from the market in Kisumu, Kenya. 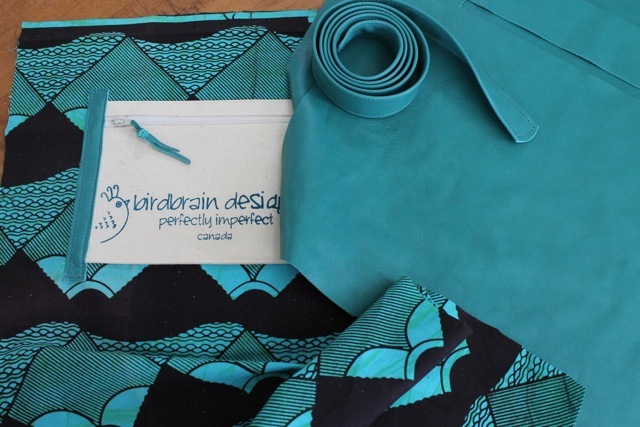 To me, it evokes the Homa Hills around Lake Victoria and is a perfect lining for the turquoise leather. 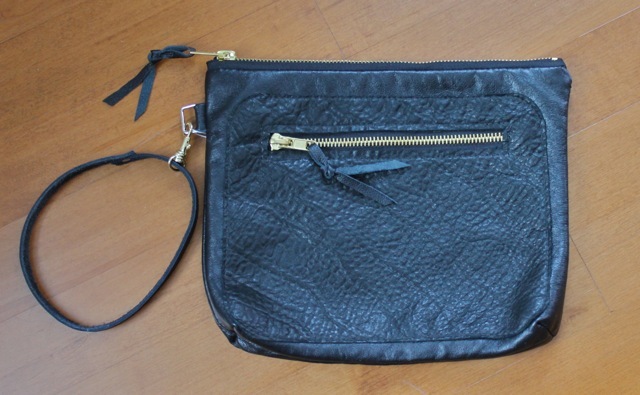 This bag will have a zipper pocket on the inside as well as one on the outside. You can see the beginnings of the bag above. Last weekend in Montreal we attended several shows, one of which involved Immigrant Women Entrepreneurs. There were many great vendors there including Afriqua Wax. 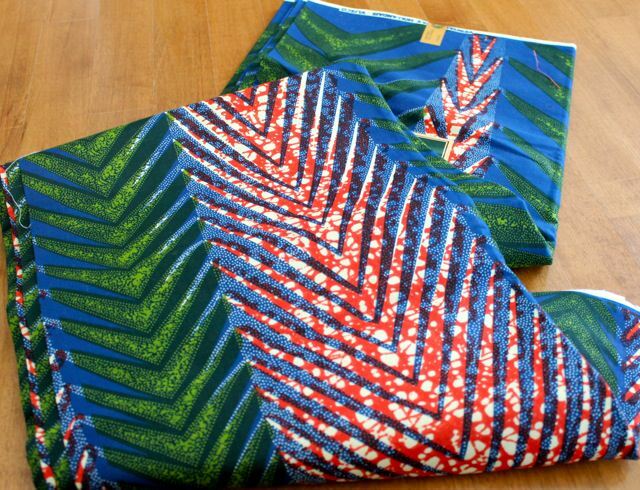 Here is what I brought home, 6 yards of Vlisco Wax Block Print. 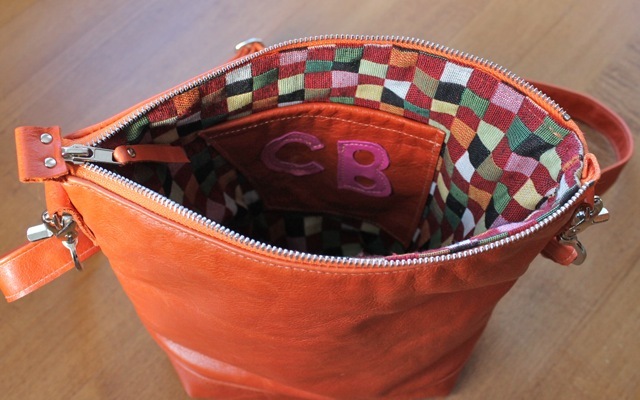 I love the complexity of the colours and the design and can already see it lining some new bags. I have made bags to order before, but this is the first time I have had such a wonderful graphic to follow. As I mentioned yesterday, we were in Montreal for four days, but I am now back and finishing up my Christmas orders. This one is for a special person–another Jan– I enjoyed making it, even being held to account for such precision. The Jan II is made from pebbly red leather and lined with canvas screen printed with birdbrain graphics. It is small and light and yet durable. 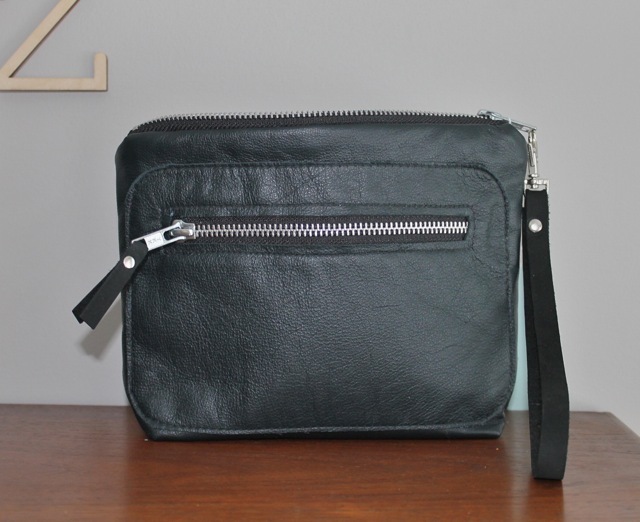 As instructed, it has a pocket inside with a zipper closing and an adjustable strap. I have been using my own version of this which is just a little bigger and I find it a perfect day bag. I hope Jan likes this one!